Here is a traditional-sounding country song. Now here is what I’m talking about. We have some music that sounds like it came out in the ’80s and ’90s. You know that’s my favorite era in country music. I love a lot of the things coming out right now, but there is something about that era that makes me feel good about country music. 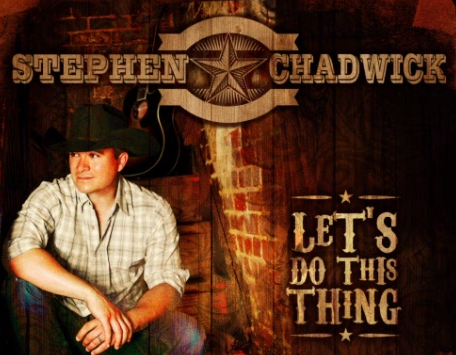 This one sounds like it could have been a hit for Mark Chesnutt, Tracy Byrd or Ty England. But that voice you’re hearing is Stephen Chadwick. It’s a pretty simple song. You have two people that are probably falling in love and the guy is in a rush to make sure that things get started. You can get busy and things can come up and before you know it you aren’t spending time together and you’re not falling in love. I wonder if that happens with people today. They can’t meet anybody because they don’t have time to meet anybody between work and other commitments. But that’s going to deep on this song. It’s a fun country song about life and the good things that come with it. And the melody is incredibly catchy. It kind of makes you want to jump off the bar stool and head out to the dance floor. And I think that’s fitting because you can ask that special someone to get out there and dance with you. Great song. What do you think?